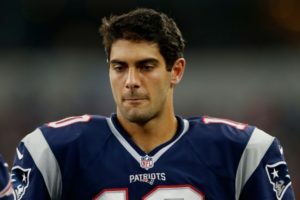 Home » Football » Will the New England Patriots Trade Jimmy Garoppolo? Rob Gronkowski won’t reappear during this postseason, it’s obvious and The Patriots have designated Jacoby Brissett, rookie quarterback to come back from injured reserve. But, why didn’t Bill Belichick opt for Jimmy Garoppolo? Should we expect early-season sensational the New England Patriots‘ player Garappolo to be traded in March 2017? Activating Jacoby Brisset sends us a message that the New England Patriots want this player to practice as much as possible, if Garappolo gets traded and he gets the backup role in season 2017/18. Bill Belichick told the press that practice helped everybody and that Brisset had got better every day for a couple of months. To us, it seems that, even if the Patriots don’t plan to trade Garoppolo, they will consider any strong offer they get. And, let’s face it, together with Tony Romo, Jimmy Garoppolo could be one of the most desired trade candidates for franchises looking for a quarterback such as Jets, Bills, Bears or 49ers. Just as a reminder, last time Belichick was in similar situation in 2009, he flipped Matt Cassel to the Kansas City Chiefs for the No. 34 pick. In addition, compared to Cassel’s, Jimmy Garoppolo’s price would be even higher, because he was tutored by Josh McDaniels and has got a way better pedigree when it comes to drafts. Tom Brady is 39 but his deep ball and pocket movement have become even better over the recent runs at the MVP award. This amazing NFL player seems to remain passionate and focused on each aspect of the game and wants to play for at least five more years. It seems that Belichick feels satisfied about keeping Brady next few seasons playing for the Patriots, provided that New England keeps on making to the Super Bowl. And, in case Jacoby Brissett convinces the team that he’s ready for this new role, offers for Garoppolo will be extremely tempting for the Patriots next year.